©2019 Hunters Books. Kids on Bikes and its logo are trademarks of Hunters Entertainment LLC. Renegade's Logos is trademark Renegade Game Studio LLC.Game SummaryOdd events are happening in Small Towns. There are Shadows in Sharon Hollow, Strange Things are afoot at the Circle Q... Not to mention there is some Double Trouble at Skateland! Will a bunch of Boxcar Boys, face a Minor Threat of Ghosts & Steel? Or will there be a Culling in Cheyenne? Only YOU can find out! 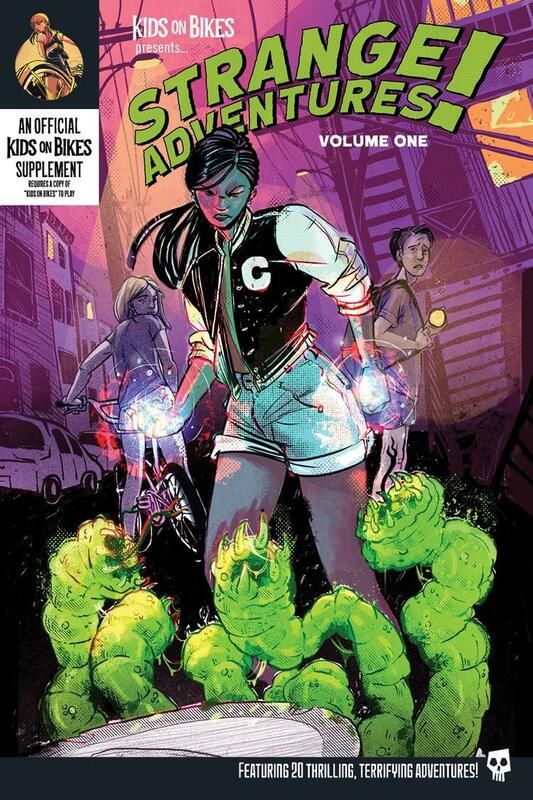 Strange Adventures #1 is a non-core book of adventure hooks and story guidelines to help you find new adventures in the RPG Kids on Bikes. Featuring 20 unique towns under the writing expertise of both new and seasoned story writers - such as Ross Watson, Scott Woodard, Elisa Teague, Matt Colville, Sen-Foon Lim, and Amanda Harmon Kunz. Find out more, in this edition of STRANGE ADVENTURES!